Ashley Magee, DVM, DACVS, describes a patient who presented with a large nerve sheath tumor on her front limb. A 13-year-old spayed, female retriever mix, presented to DoveLewis’ surgery department for evaluation and possible removal of a large tumor on the right forelimb. She was diagnosed with a peripheral nerve sheath tumor approximately 18 months prior via incisional biopsy. The histopathology report characterized the malignant neoplasm as relatively low grade. No treatment was elected at that time. From diagnosis to presentation to DoveLewis, the mass grew considerably and the skin had become irritated and thin, and the dog had begun to lick at the mass. A consultation with an oncologist had been pursued and surgical debulking recommended since amputation was not considered an option by her owners due to good function of the limb, age, and lifestyle considerations (she lives on a houseboat). On examination, the patient was bright and alert with a normal physical examination other than a 10 x 14 cm irregular, ovoid, soft tissue mass associated with the right antebrachium. The central 5 cm of skin was erythematous, partially ulcerated, and painful to palpation. No lameness was noted. Recent CBC, serum chemistry, urinalysis and three view thoracic radiographs were within normal limits. After discussing their options and the potential complications (failure to heal, rapid regrowth of the mass, neurovascular complications and anesthetic risks) of debulking surgery, the clients decided to go forward with the procedure. The dog was admitted to the hospital for surgery. An intravenous catheter was placed and she was started on 5 ml/kg isotonic fluids presurgically. Standard premedication with hydromorphone 0.1 mg/kg and midazolam 0.2 mg/kg was given IV, along with a perioperative dose of cefazolin IV at 30 mg/kg. Preoxygenation was started and pulse oximetry and electrocardiographic monitoring begun prior to induction. Anesthesia was induced with propofol 5 mg/kg IV to effect, the dog was intubated and placed on isoflurane in oxygen for maintenance. Fluids were increased to 10 ml/kg/hr. The patient was placed in dorsal recumbency and a hanging limb prep performed. A brachial plexus block was performed in standard fashion using 2 mg/kg lidocaine and 0.5 mg/kg bupivicaine for supplemental analgesia. The patient was moved into the OR for surgery. An ovoid skin incision was made around the base of the mass, preserving grossly normal medial and lateral skin. Hemorrhage was controlled with electrocautery and ligation where appropriate. Sharp dissection was used to free the mass from underlying subcutis and fascia, ligating larger vessels with 3-0 polyglyconate. The mass originated from an irregular pedicle about 3 cm in length starting from the deep fascia between the extensor carpi radialis and digital extensor muscle bellies. The pedicle and mass with attached fascia and skin were removed en bloc and residual grossly abnormal tissue removed. The area was lavaged with a liter of warm saline then gloves and instruments changed. The large size and weight of the mass had effectively stretched the surrounding skin to the point that tension free longitudinal closure could be performed with undermining alone. The subcuticular layers were closed using 3-0 Maxon in a simple interrupted pattern. Skin was closed with 2-0 polypropylene in a simple continuous pattern. The limb was placed in a soft padded bandage. The clients declined submission of the mass for evaluation of the tumor margins. The dog recovered quickly and uneventfully from surgery and was discharged to her owners later that evening with oral pain medications (tramadol and gabapentin). She was rechecked at 48 hours, one week, and two weeks post-operatively. The surgical wound healed normally and the patient did not experience any complications. Follow-up seven months post-operatively revealed she had no gross evidence of tumor regrowth and was otherwise normal. Peripheral nerve sheath tumors are masses arising from nervous tissue; the specific cell origin is often not identifiable. They have variable histologic characteristics of malignancy, but often cause considerable local invasion and have a low rate of distant metastasis. The thoracic limbs are more commonly affected in dogs. If associated proximally with a nerve root, lameness is characteristic, but when located more peripherally on the limb, lameness may not be part of the clinical problem. When associated with the spinal column, lameness, muscle atrophy, and significant neurologic dysfunction are often present. When associated with a major motor nerve such as the radial nerve, limb weakness or dysfunction may be present before or after resection of the mass. 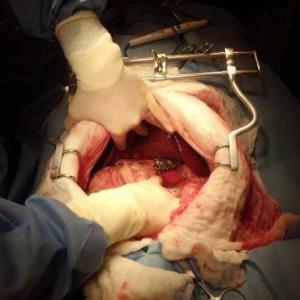 Treatment consists of resection of the tumor with wide margins. Amputation is often required to obtain adequate margins and due to resection of motor nerves to the limb along with the tumor, making the limb non-functional. In this case, amputation was not considered a good option by the owners. Because the mass was causing no neurologic dysfunction, was located distally on the limb below the major nerve trunks, and no metastasis was detected on presurgical screening, debulking was considered reasonable to obtain significant palliation of the disease. Residual neurovascular dysfunction was discussed as a potential complication of the surgery, along with wound healing complications and aggressive return of the tumor. 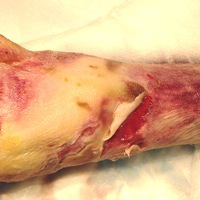 These complications and the potential need for later amputation or euthanasia should complications be severe, should be discussed with clients prior to performing palliative debulking of a peripheral limb tumor. This dog’s procedure was successful for several reasons. At surgery, no direct association with a major nerve trunk was found and forelimb musculature was not invaded, leaving these structures intact and preserving her limb function. Similarly, the cephalic vein and radial and median vasculature was preserved, allowing for retained circulation to the surgical site and optimal environment for healing. 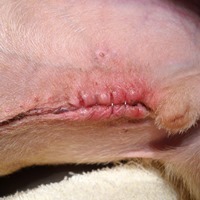 The ability to obtain primary closure of the wound was of significant benefit; the skin stretching effect of the mass provided grossly normal skin for closure. Skin stretching techniques such as presuturing for several days prior to surgery or creation of a transposition flap from brachial skin at surgery are relatively simple techniques that could be employed to help create a tension-free wound closure when adequate skin is not available. In summary, tumor debulking can be rewarding in select cases and patients can have a satisfactory tumor-free interval when more aggressive surgical methods are not appropriate or desired by the client. Tumor type, location and patient specifics should be evaluated together to determine the likelihood for success, and clients should be well educated in the risks and potential pitfalls of the procedure.